Last night the Department of Culture and Creative Industries at City University London hosted the UK launch of the United Nations Creative Economy Report 2013. 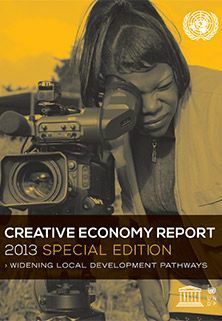 The report examines the interactions, policies, and specific challenges facing the development of the creative and cultural sector at the local level, and determines how the creative economy is practically promoted in communities across the developing world. The panel included: John Newbigin, Chair, Creative England; Andy C Pratt, Professor of Cultural Economy, City University London and Professor Raj Isar, The American University of Paris. In the build up to the event Professor Andy Pratt produced an article for the theconversation.com which discussed the thriving creative sector and the impact it has had on the UK economy. The creative industries have not only survived, but also thrived, in the recession, according to data released by the UK Department of Culture, Media and Sport. This may come as a shock. The report details how the much heralded "green shoots" of the wider economy were represented by a 0.7% growth in 2011-12. By comparison the creative industries grew by 8.6%, the sort of growth rates we associate with China in recent years. How do we explain this? Most people would regard such growth as counter-intuitive; we've all accepted the notion that in recession the first thing we sacrifice in hard times are non-essentials: films not food. It turns out this is just wrong. Take the film industry, a core creative industry, in the "great crash" of the 1920s. Hollywood took a hit, but bounced back into its golden age in quick-time: we like escapism when times are tough. Also, speak to any student who lives on a minimal income, and a poor diet, but still can afford to go to gigs, or buy music. Looking at the recent recession the picture is similar. Even so, things have changed. Film and books, and the traditional music, theatre and fine arts no longer dominate the creative industries. Television has transformed our lives, as has the internet, and the convergence of all the creative industries that we see today. So, the creative industries have undergone massive growth as well as transformation. Digitisation has delivered opportunities that have been exploited by the creative industries, offering a new melding of narrative, design, and technology. Perhaps the poster child is the computer games industry, which globally is set to challenge the place of film as the lead media in the creative industries field. The problem is the creative industries have an image problem: politicians, academics and policy makers don't take them seriously. When the Department of Culture, Media and Sport was renamed from the Department of National Heritage in 1997, it was derided as the "department of fun". The publication of the Creative Industries Mapping Document in 1998 was the first time a proper economic audit of these industries had taken place. In part, the problem is that they are new. This is a problem for statisticians - data is collected on the assumption that the future will be the same as the past. For census collectors if you worked in the many of the creative industries you were bundled into a "not elsewhere classified" category. It turns out that when you collect up the creative industries from the "not elsewhere classified" bin they add up to a £71 billion value to the UK economy, and 5.6% of the workforce: which is quite a shock. In the past 15 years statistical collection has improved. It turns out that the UK figures were not a "flash in the pan", similar figures, and growth rates, have been recorded in UN reports. It is revealing that an EU report recently noted that the creative industries in Europe employ as many people as the combined car industry, chemical industry and power generation. Given the high esteem that politicians give these industries, the creative industries have clearly been overlooked. Moreover, these traditional industries are all declining, by contrast, the creative industries are growing. The creative industries may be "Mickey Mouse" subjects in the view of politicians - but then again, Disney is one of the world's largest corporations. Game playing and special effects make money. The games industry now outstrips NASA in computing heft, and the US military buys its simulation software from them. The challenge for politicians is to take this new set of industries seriously; it is also a wake-up call for academics in the normative disciplines of politics, law and economics to take these things seriously. There is also the question of training the future workers in the creative industries. The creative disciplines - humanities, media and communications scholars - cannot rest on their laurels. A significant challenge is to balance the traditional advocacy of art for art's sake, and art and culture that have a market value. This is why one of the most exciting and controversial debates of the future will be the one around how to place a value on culture. Read the original article and others from City academics at theconversation.com.